Is your farm ready in the event of an accident, fire or a force of Mother Nature? Many times we take for granted being prepared for these unforeseen incidents. A little time planning up front can help you respond quickly and effectively when needed. Also, be sure to have a training program for new employees and go over your plan annually. A little time can save a life! Be proactive and review your emergency preparedness plan today. Are emergency numbers, including name and address of nearest medical facility are posted where everyone can see them? Are the directions to your farm posted by the phone or in a central location? Is there at least one person trained in First Aid and CPR? Are there designated safe places for floods, tornadoes, lightning and fires? Are the fire extinguishers easy to identify and retrieve? Have they been checked recently to ensure they are full? Are all exits clear of obstacles and clearly marked? Do you have a training program for all new employees? Do you go over your training program with all family members and employees yearly? 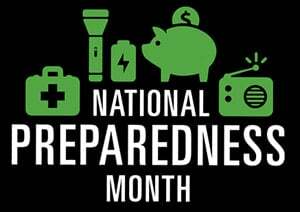 National Preparedness Month will focus on planning, with an overarching theme “Disasters Don’t Plan Ahead. You Can.” For tips and ideas to promote preparedness, including the National Preparedness Month Social Media Toolkit, visit www.ready.gov/september.